You are going to Watch G.I. Joe: The Revenge of Cobra Episode 5 online free episodes with HQ / high quality. Stream cartoons G.I. Joe: The Revenge of Cobra Episode 5 Online Amusement Park of Terror. Zartan broadcasts an unsecured message to the Joes and Cobra offering to bargain for his particular fragment. Both sides trace his call to an amusement park. Cobra captures Zartan, and now they possess all the pieces of the Weather Dominator, since Storm Shadow sneaked into Joe headquarters and stole their fragment. Duke and company raid the Cobra Command center as Roadblock uses vines to attack Destro. The Joes are able to destroy the Weather Dominator, rescue Duke and company and apprehend Cobra Commander. 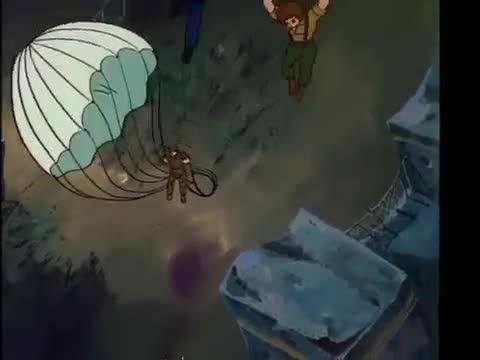 However, Destro and Zartan manage to escape on a hang-glider.